Embrace the rhythm of the ocean, the warm sea breezes and the sounds of nature in the jungle. This paradise setting becomes the heartbeat for your yoga practice, surfing adventure and wellness experience. If your focus is yoga, surfing, detoxification, nutrition, self-healing or a combination of all five, we have the right retreat for you. Embrace the rhythm of the ocean, the warm sea breezes and the sounds of nature in the jungle. This paradise setting becomes the heartbeat for your yoga practice, surfing adventure and wellness experience. If your focus is yoga, surfing, detoxification, nutrition, self-healing or a combination of all five, we have the right retreat for you. Our all inclusive retreats are designed to nourish your body, mind, and spirit. Relax while viewing the Pacific Ocean and take in the beauty of Nicaragua. Enjoy the off shore winds blowing down a mile long white sand beach, surrounded by lush coconut palms and tropical gardens while listening to the waves lapping on the empty shores. 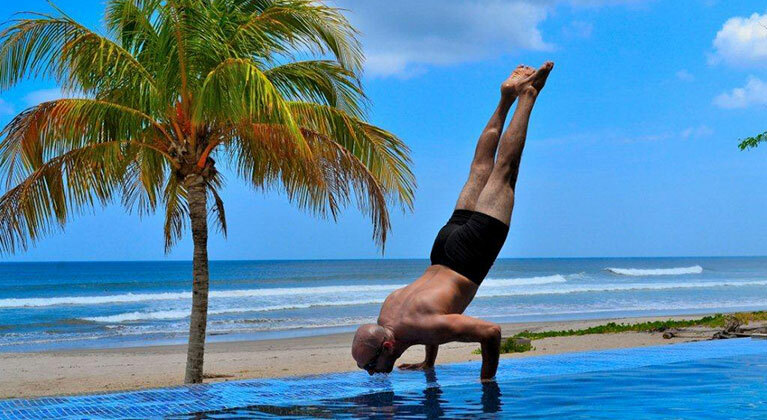 At Mark and Dave’s we offer “Ocean Front” all inclusive yoga packages for groups of 8+. We also offer classes for our guests and private classes are available upon request.